Jonathan Diaz, TrialCard’s Business Intelligence and Analytics Product Manager, will be speaking at the annual MicroStrategy World Conference held in Washington, D.C. from April 18-21, 2017. The event, which brings together data experts from around the world and across multiple industries, offers educational workshops and presentations about current trends in the business intelligence and analytics field. Diaz’s presentation will focus on how TrialCard is using the MicroStrategy platform to provide its pharmaceutical manufacturer clients with dynamic and insightful data solutions that enable brand marketers to make more informed business decisions. “Our clients continually tell us that the depth of data we offer and the manner in which we’re able to provide it to them is critically valuable to their ability to evaluate and adjust their marketing tactics,” said TrialCard President and CEO Mark Bouck. 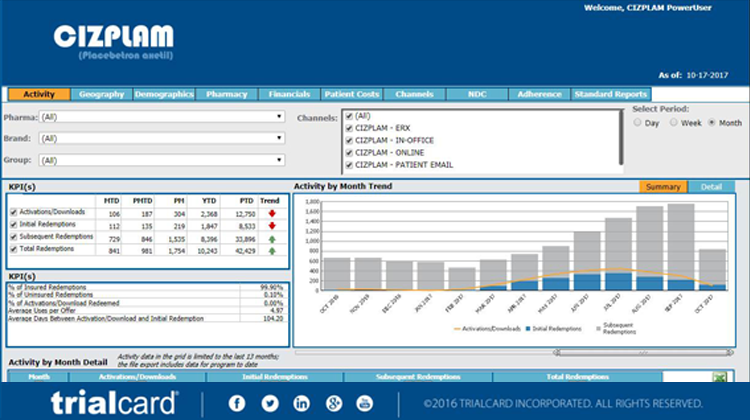 TrialCard’s TC Catalyst Analytics package, built on MicroStrategy, features a client dashboard, a menu of standard reports, and the ability to create customized reports and ad hoc analytic products. TrialCard also developed a TC Catalyst Analytics mobile app to support pharmaceutical field representatives by providing access to data while traveling to meetings.